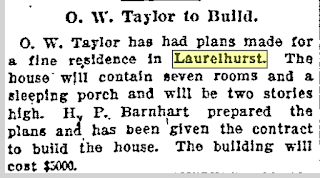 As you may recall, the center of Laurelhurst was originally composed of three houses. 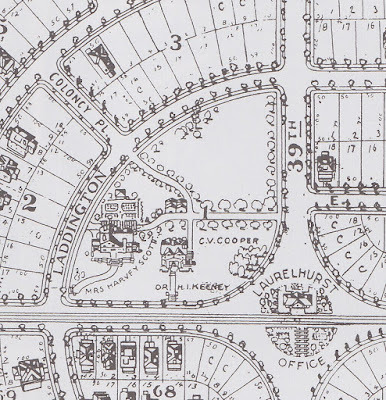 Since it was reportedly the most "sightly" part of the development, the plan was to have four oversize grand houses with huge yards in that block. 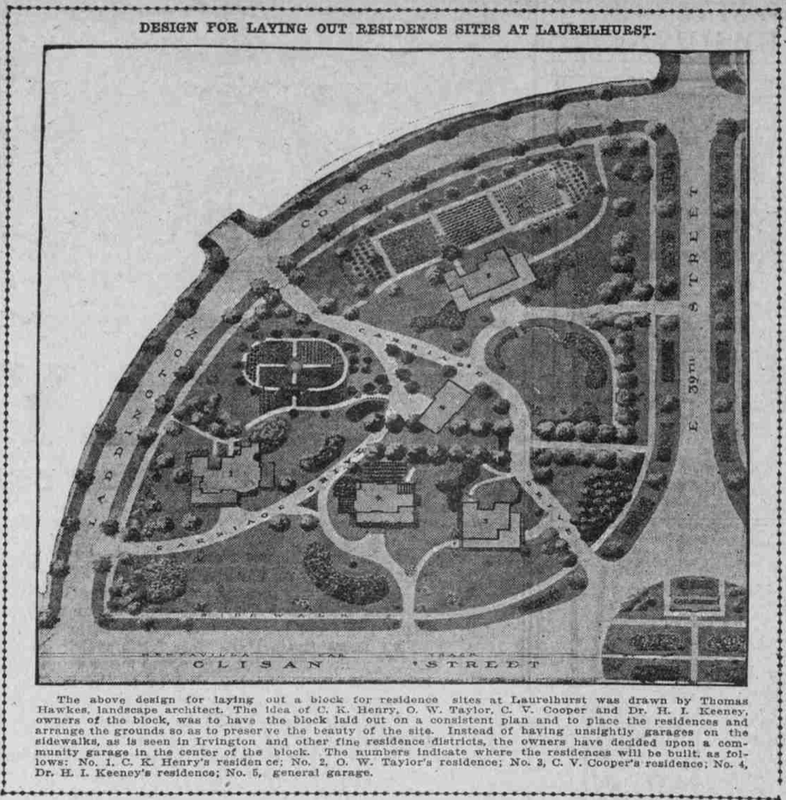 The above design for laying out a block for residence sites at Laurelhurst and drawn by Thomas Hawkes, landscape architect. The idea of C.K. 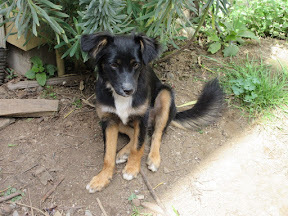 Henry, O.W. Taylor, C.V. Cooper and Dr. H.I. Keeney, owners of the block, was to have the block laid out on a consistent plan and to place the residences and arrange the grounds so as to preserve the beauty of the site. 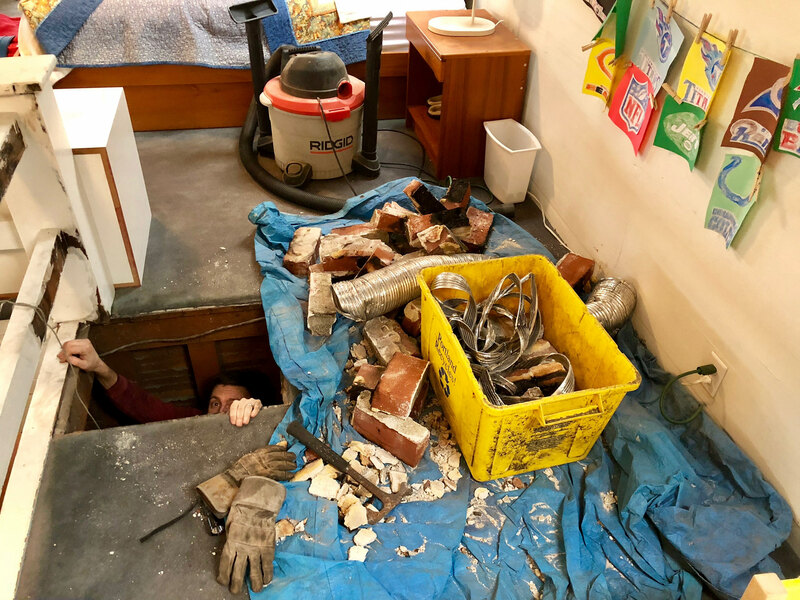 Instead of having unsightly garages on the sidewalks, as is seen in Irvington and other fine residence districts, the owners have decided upon a community garage in the center of the block. The numbers indicate where the residences will be built, as follows: No. 1, C.K. Henry's residence; No. 2, O.W. Taylor's residence; No. 3, C.V. Cooper's residence; No. 4, Dr. H.I. Keeney's residence; No. 5, general garage. Charles K. Henry is having plans prepared for a $15,000 home on Laurelhurst Avenue and Dr. Homer I. Keeney will start in the immediate future to build a $7000 home on this same avenue. 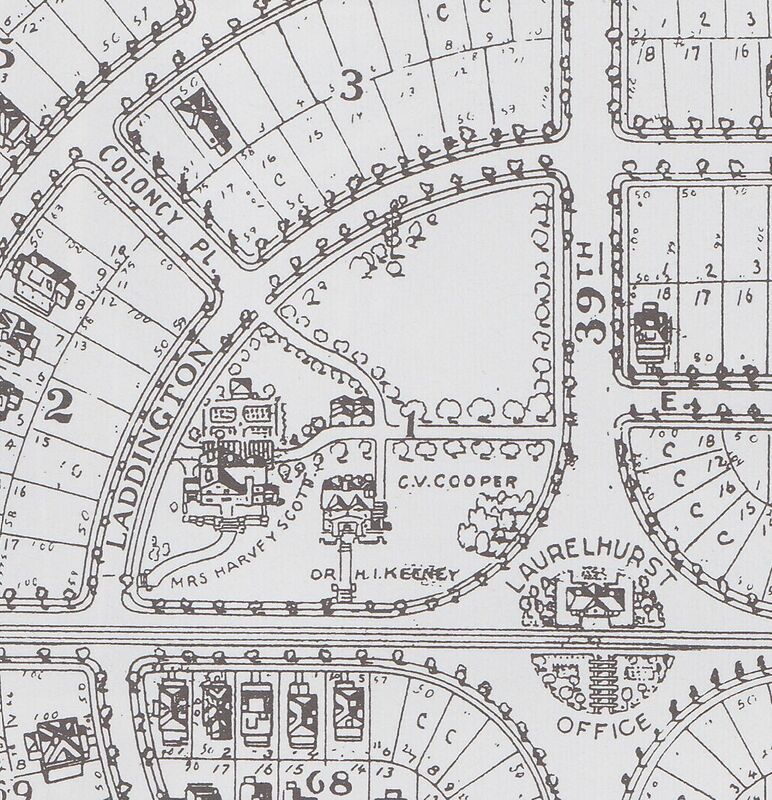 Among other residences planned to be erected this Summer are those for Francis Dubois Jr., to cost $5000; W.S. 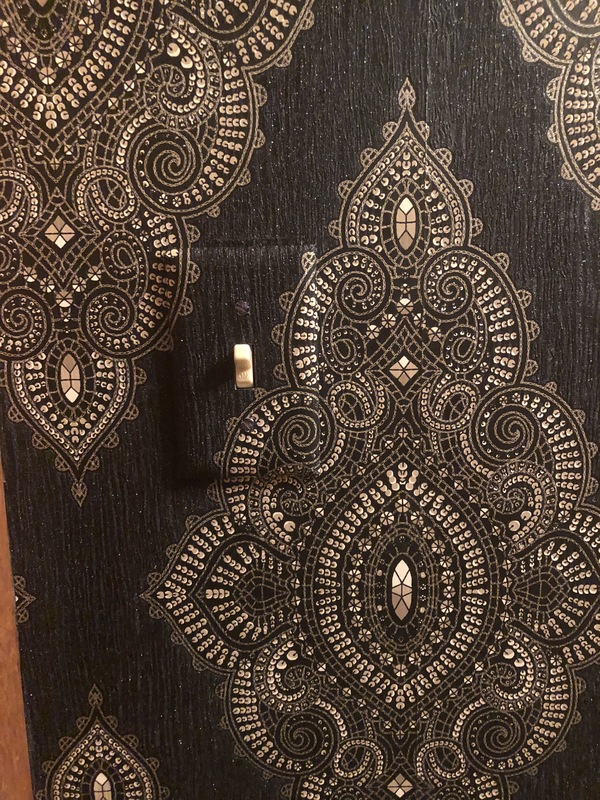 Hurst, a $5000 home; A.E. Kern, $5000; Grant Foster, between $4000 and $5000; H.C. Gresel, $5000; Charles V. Cooper, $10,000; C.S. Russell, $7000; and O.W. Taylor, $10,000. O.W. 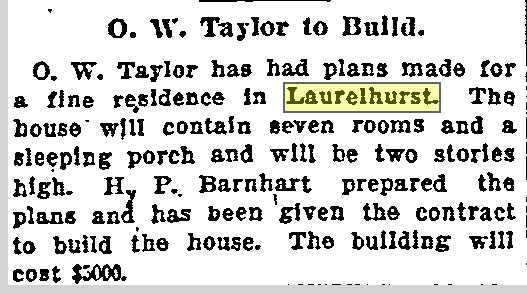 Taylor has had plans made for a fine residence in Laurelhurst. The house will contain seven rooms and a sleeping porch and will be two stories high. H.P. Barnhart prepared the plans and has been given the contract to build the house. The building will cost $5,000. 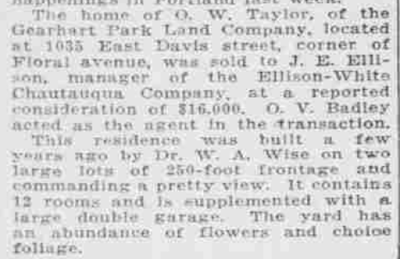 However, in 1917, I find he has sold a residence at 1035 Davis Street. The home of O.W. Taylor, of the Gearhart Park Land Company, located at 1035 East Davis street, corner of Floral avenue, was sold to J.E. Ellison, manager of the Ellison-White Chautauqua Company, at a reported consideration of $16,000. O.V. Badley acted as the agent in the transaction. This residence was built a few years ago by Dr. W.A. Wise on two large lots of 250-foot frontage and commanding a pretty view. It contains 12 rooms and is supplemented with a large double garage. The yard has an abundance of flowers and choice foliage. I'm not really sure what made him back out of building the other house. Perhaps it's because he found another he liked more, or maybe it was a better deal? We'll never know. In any case, that fourth lot stayed vacant in the center of the development. C.K. Henry sold his house to Mrs. Scott in 1913 and retired to Pasadena, California. Apparently, in Jun 1914, Laurelhurst company sold the lot to All Saint's Church to build a church. It looks like Mrs. Scott sued to try and prevent the building of the church, but she obviously lost. 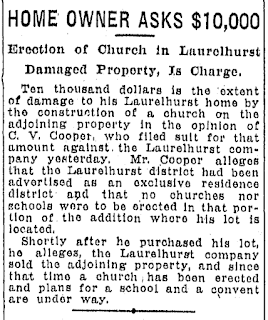 Then, I found an article from 1919 about Mr. Cooper suing Laurelhurst company. 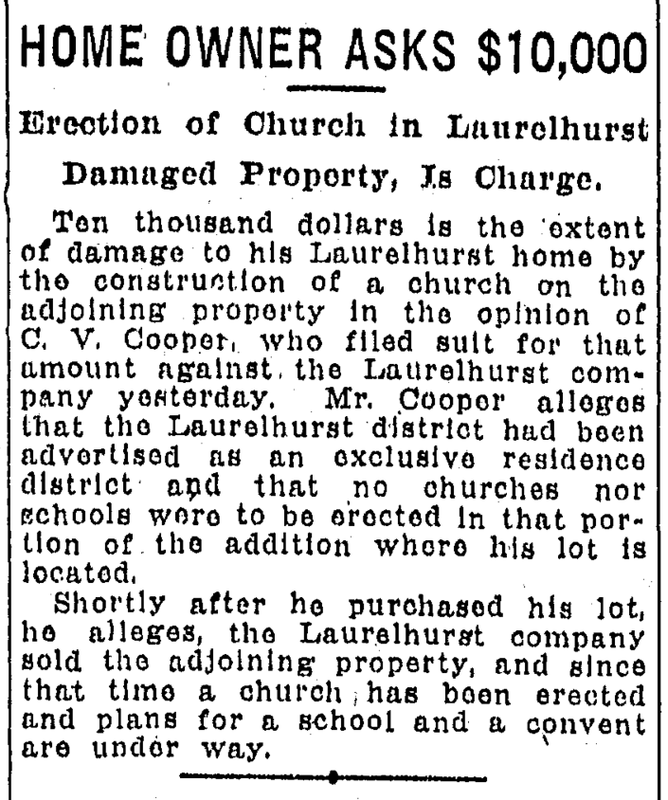 Ten thousand dollars is the extent of damage to his Laurelhurst home by the construction of a church on the adjoining property in the opinion of C. V. Cooper, who filed suit for that amount against the Laurelhurst Company yesterday. 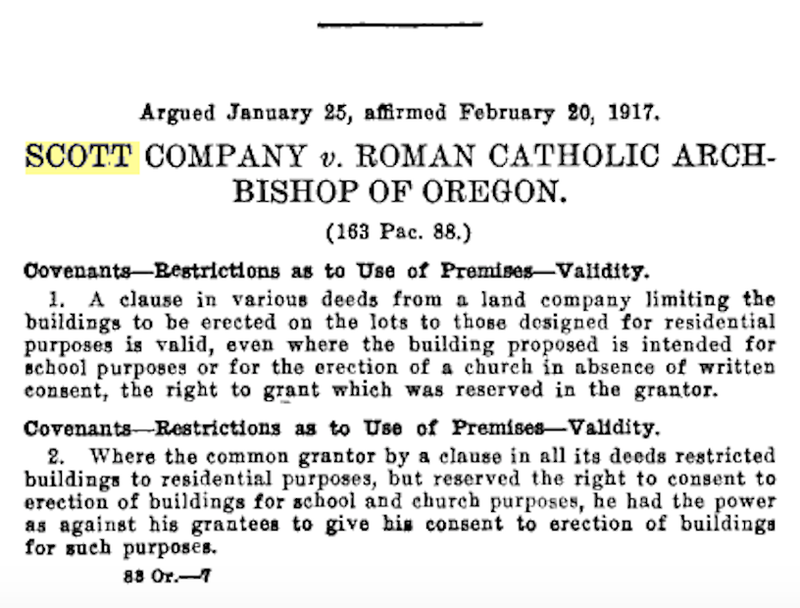 Mr. Cooper alleges that the Laurelhurst district had been advertised as an exclusive residence district and that no churches nor schools were to be erected in that portion of the addition where his lot is located. 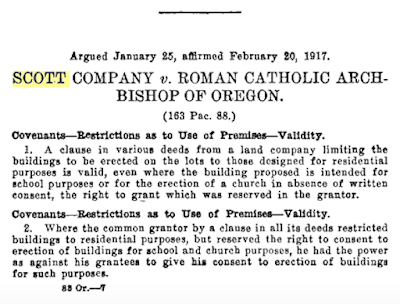 Shortly after he purchased his lot, he alleges, the Laurelhurst company sold the adjoining property, and since that time a church has been erected and plans for a school and a convent are under way. By Nov 1917, All Saints' was building this church. I found a bio for Dr. Homer Keeney in Ancestry. It looks like he enlisted in 1918 in the US Army for war service and then eventually relocated to California. 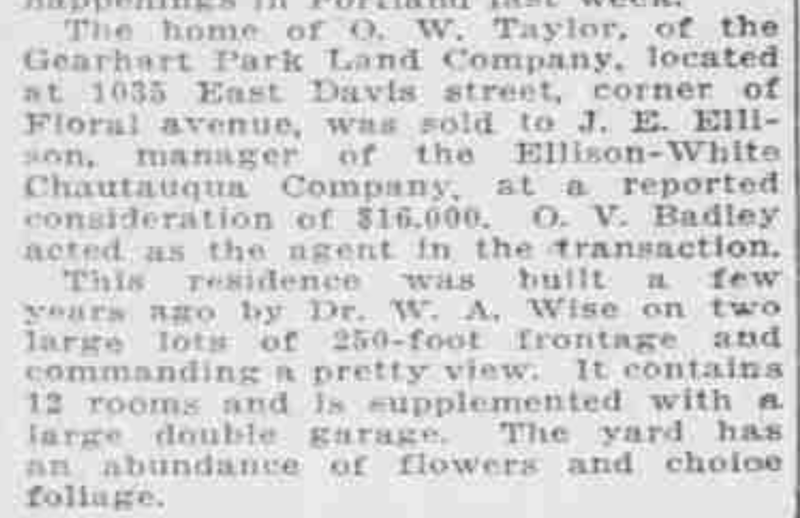 Based on later Oregonian articles, it looks like he sold the house to James D. Abbott, a former member of the state legislature and a republican. Mrs. Abbott, apparently, held events at the house for the local Daughters of the American Revolution group. Beyond that family, I have no idea what happened to the house. I found a listing in Rootsweb that Charles V. Cooper died in 1921. I think his house is still there, but it's hard to tell because it is surrounded by vegetation. I assume the church owns it. Margaret Scott died in June 1925 and left her estate to her children. I'm not sure what happened to her house, but I suspect since they were already grown and had houses, they simply sold it. 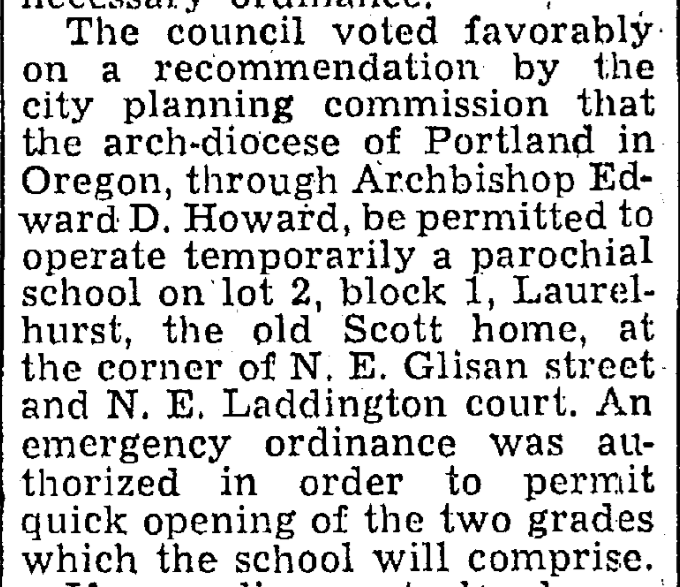 There was an absolutely huge battle about the church adding a school in the 1930s. About 80% of the residents in the neighborhood were opposed to the school but they built it anyway. By 1945, the church owned the Scott house and started using it as a school. 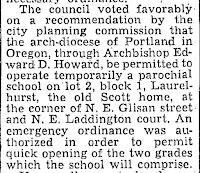 The council voted favorably on a recommendation by the city planning commission that the arch-diocese of Portland in Oregon, through Archbishop Edward D. Howard, be permitted to operate temporarily a parochial school on lot 2, block 1, Laurelhurst, the old Scott home, at the corner of NE Glisan street and NE Laddington court. An emergency ordinance was authorized in order to permit quick opening of the two grades which the school will comprise. In 1966, they tore it down. I don't have any idea (yet) when they took down Keeney's house. Maybe in the 1930s when they built the first school? 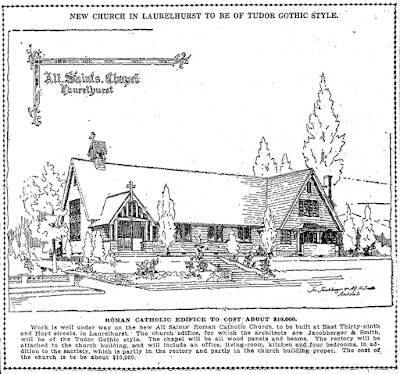 New All Saints Roman Catholic Church will be built on the site of this old house being torn down at NE Laddington Court and Glisan Street. 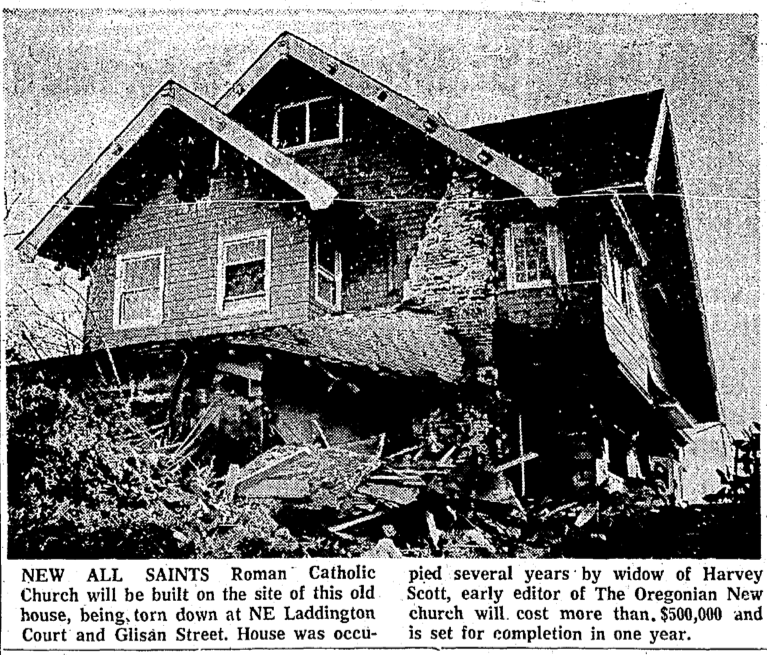 House was occupied several years by widow of Harvey Scott, early editor at The Oregonian. New church will cost more than $500,000 and is set for completion in one year. 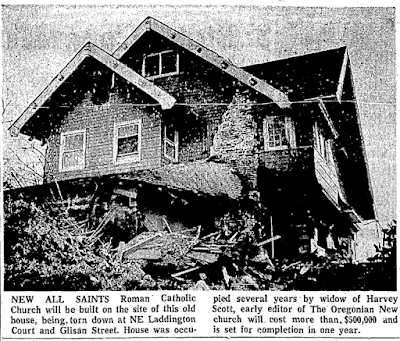 The Oregonian, 1 Mar 1966. What a difference 50 years makes. When this house was built, it was credited with being a Gem of Laurelhurst and an Eastside landmark. But by the 60s, it was constantly referred to as an old house. Every time I saw it mentioned, it was referred to as the old Scott house. I'm sad that these houses are gone, but life moves on. I'm fascinated by their history mostly because they were built by the same builder as my house and I find the mystery interesting to explore. I do find it tragic that they didn't move the house and that the astonishingly expensive landscaping was turned into a parking lot. Surely such a grand house was worth moving. It's hard to imagine that somebody wouldn't have been willing to relocate the house if they had offered it up before demolishing it. Perhaps they had ruined it inside.